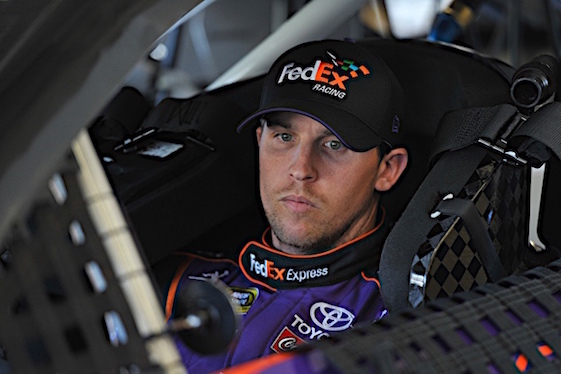 The pole was Hamlin’s third in the last four races and the 29th of his career. Larson ran the fastest laps of the afternoon in the first round, covering the distance in 27.908 seconds (176.208 mph). The driver of the No. 42 Chip Ganassi Racing Chevrolet was second fastest behind eventual fourth-place qualifier Alex Bowman in the second round before falling just short on his final lap. “I just got a little too loose there in the center of (Turns) 1 and 2 and at the exit of 3 and 4, which I felt cost me a little bit of time,” Larson said. “I didn’t need much to get the pole. I felt like we had a better car than Denny throughout qualifying there. (11) Denny Hamlin, Toyota, 173.571 mph. (42) Kyle Larson, Chevrolet, 173.411 mph. (78) Martin Truex Jr., Toyota, 173.204 mph. (88) Alex Bowman, Chevrolet, 173.155 mph. (18) Kyle Busch, Toyota, 173.064 mph. (31) Ryan Newman, Chevrolet, 172.832 mph. (20) Erik Jones, Toyota, 172.511 mph. (22) Joey Logano, Ford, 172.505 mph. (41) Kurt Busch, Ford, 172.336 mph. (24) William Byron #, Chevrolet, 172.245 mph. (9) Chase Elliott, Chevrolet, 171.381 mph. (10) Aric Almirola, Ford, 170.030 mph. (2) Brad Keselowski, Ford, 172.790 mph. (21) Paul Menard, Ford, 172.517 mph. (6) Matt Kenseth, Ford, 172.475 mph. (19) Daniel Suarez, Toyota, 172.408 mph. (14) Clint Bowyer, Ford, 172.263 mph. (3) Austin Dillon, Chevrolet, 172.034 mph. (37) Chris Buescher, Chevrolet, 171.818 mph. (48) Jimmie Johnson, Chevrolet, 171.734 mph. (12) Ryan Blaney, Ford, 171.566 mph. (4) Kevin Harvick, Ford, 171.542 mph. (38) David Ragan, Ford, 170.691 mph. (47) AJ Allmendinger, Chevrolet, 170.572 mph. (17) Ricky Stenhouse Jr., Ford, 172.917 mph. (34) Michael McDowell, Ford, 172.881 mph. (43) Bubba Wallace #, Chevrolet, 172.614 mph. (13) Ty Dillon, Chevrolet, 172.293 mph. (95) Kasey Kahne, Chevrolet, 172.034 mph. (32) Matt DiBenedetto, Ford, 171.812 mph. (1) Jamie McMurray, Chevrolet, 170.637 mph. (52) JJ Yeley(i), Chevrolet, 170.430 mph. (15) Ross Chastain(i), Chevrolet, 169.994 mph. (72) Corey LaJoie, Chevrolet, 169.042 mph. (00) Landon Cassill(i), Chevrolet, 167.665 mph. (66) Timmy Hill(i), Toyota, 163.822 mph. (51) BJ McLeod(i), Chevrolet, 163.713 mph. (99) Derrike Cope, Chevrolet, 160.381 mph. (23) Joey Gase(i), Toyota, 154.734 mph. (96) Jeffrey Earnhardt, Toyota, 0.000 mph.